Inside your body breathes a person—a soul. Inside the body of Jewish practice breathes an inner wisdom—the soul of Judaism. We often call it “Kabbalah”, meaning “receiving.” Just as Jewish practice is received through an unbroken, ancient tradition from the revelation at Sinai, so is its soul. Kabbalah, then, is the received wisdom, the native theology and cosmology of Judaism. Kabbalah is not a secret teaching. It is the teaching of a secret. “The secret teaching” means that we are trying to hide something from you. “The teaching of the secret” means that we are trying to teach something to you, to open up and reveal something hidden. Now, you might point out, if the secret is taught, it is no longer a secret. A revealed secret, it would seem, is an oxymoron. That would be so if we were discussing an artificial secret, one that is secret only because it is shrouded in secrecy, because others don’t want you to find out. True secrets, even once taught, explained, illustrated, analyzed and integrated into your consciousness, remain just as mysterious as before. No—vastly more mysterious, for as the island of knowledge expands, so too its beach upon the infinite sea of the unknowable. Life teems with such mysteries: What is love? What is mind? What is life? What is existence? How do they come to be? From where do they emerge? What is your soul, the person within your body? You experience all these at every moment. They are you. And yet, the more you gaze upon the depths of their mysteries, the deeper their waters become. The deepest of all secrets are those best known to all, that which we learn as small children, take for granted the rest of our lives, live with daily—and yet never manage to unravel or grasp with our cognitive mind. There is. Things are. I exist. I am alive. Life is not death. Darkness is not light. There is that which is bigger than me. Kabbalah plunges into these secrets and pulls their depths into the open. It provides metaphor, parable, understanding. It shines light and opens our eyes. It inspires and guides us to use this wisdom for healing and growth in everyday life. That is why the experience of learning Kabbalah is one of “Yes! I knew that truth all along! My heart knew, but my mouth was unable to speak it!” The truths of the Kabbalah belong to every sentient being. Yet, most of all, Kabbalah provides a sense of the beyond; the knowledge of that which cannot be known, the wisdom of mystery, the understanding that we do not understand. Kabbalah is the knowledge of wonder. Why Is Kabbalah So Secret? Teaching a secret is fraught with danger. The student is in danger, for he may believe he truly understands. A mystery can never be presented without the wrappings of metaphor and parable. Perhaps the student will grasp the wrappings but fail to unravel its contents, as one who chews the husk and discards the fruit inside. The teacher is in danger, for how can he know if he is truly understood? He will teach many students, his ideas will become popularized, their essence will be lost and their meaning will be twisted into the opposite of his intent. The Kabbalah itself is in danger, for once it has lost its integrity, immediately it is no longer “the received wisdom.” It may be wise, it may be beautiful, but it is no longer Kabbalah. That is why, for most of time, Kabbalah was transmitted from teacher to select and trusted student, in utmost confidence. When it was written, the writings were purposely cryptic and arcane, in whispered riddles, parables and darkened allusions. At times, restrictions had to be reaffirmed to censure all but a select few from studying Kabbalah. Only in the past few hundred years have master teachers begun to reveal these truths openly. 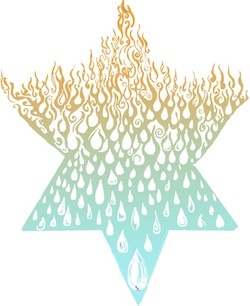 The chassidic masters uncovered a light and provided a set of metaphors that allow all to approach that light, bringing the Kabbalah into the domain of even the simplest soul. Yet still, a guide is indispensable, and great care must be taken to preserve the purity of the teachings. The waters of this spring must be kept pure; they must remain living waters. Who is that guide? How do you know that you are receiving pure waters, straight from the original spring? For one thing, pure water reflects clearly. If the teacher’s life does not reflect his teachings, his waters are impure. Next, know that until Moshiach comes, the path within is never without struggle. If the teaching comes easily, it is not the inner teaching. And third: It’s true that you do not need to be Jewish to imbibe the sweet wine of Kabbalah or to learn its healing paths. But the soul of Kabbalah is unlike a human soul—never can it be ripped from its body, for the marriage of soul and body is complete. Jewish practice and Kabbalah are one. If you are told, “This has nothing to do with Judaism,” you are being told a lie. Kabbalah is an aspect of Torah, and Torah means “guidance” or “instructions.” Everything in Kabbalah is meant as an instruction in life. We study Kabbalah not to just to reach a high, but because we need its inspiration in everyday life, and because it provides us direction and practical guidance. Kabbalah provides a cosmic dimension to the issues of everyday human life. Illness is a reflection of the lovesickness of the divine presence for the Infinite Light. The challenges in life are the sparks lost in the primal act of creation, coming to you to be repaired and elevated. Your life is a mission, in which you are directed to the divine sparks that belong uniquely to your soul, for which your soul has returned many times to this world until they will all be gathered. Understanding the cosmic dimension means that nothing in life is trivial. Everything has meaning. Everything moves toward a single purpose, with a single goal. Understanding allows you to take on those challenges and to complete the journey of your soul. How Does Kabbalah Differ from Other Spiritual Teachings? There are many wise spiritual teachings from peoples in every part of the globe. In their practice, people find transcendence of the material world, enlightenment and serenity. To the Kabbalist, the ultimate paradise is here now, because the Infinite Light is here now. The focus of Kabbalah is not on serenity. Neither is it on transcendental enlightenment. It provides those as well, but as a means, not as a goal. The goal of Kabbalah is inspired action. Whatever wisdom the Kabbalist gains, whatever state of ecstasy or mystic union to which he or she ascends, the end result will always be an act of beauty in the physical world. To turn it the other way around: Many teachers will tell you to do good deeds and acts of kindness because that is one stone along the path to higher consciousness. The Kabbalist will tell you that in the moment of that good deed, you are there already. The act itself is your goal, to which a higher consciousness must lead you. To the Kabbalist, the ultimate paradise is here now, because the Infinite Light is here now, and more than any spiritual realm, this is where the Infinite Light yearns to be discovered. Our job is to peel away the husk to reveal that light within each physical artifact of our world. To enlighten not only ourselves, but every living being, and even the inert matter of our world. The revelation at Sinai was first and foremost an experience of inner truth. What would you they tell you? The commandments themselves—to have no other gods, to honor parents, to not steal or murder—these were but the content of that experience. The medium, the experience—this was the core of the message. It was in that mystic experience that our people were born—the experience of a world in which “from every direction, G‑d spoke with them.” They saw all of reality as nothing but the words of a single, unknowable origin of all things. And they came into communion with that Source. For about a thousand years after Sinai, the Jewish experience remained defined by prophecy. Wisdom was known to the people through seers and prophets, men and women who separated themselves from human lusts and vanities to attain a clear vision of the inner realms. Yet none of these visions provided a new revelation, adding or subtracting anything from the Torah. They were simply affirming, clarifying and sustaining the shared vision of Sinai. The era of prophecy came to a close at the beginning of the Second Temple period, but divine revelation and mystic vision never departed. Neither did the receivers of that wisdom sit at the fringe of Jewish tradition. Many, if not most, of the better-known masters of the soul of Torah were also the established masters over the body of Torah practice. Rabbi Akiva is often considered the father of the Mishnah, and both the Talmud and Sefer HaBahir describe his mystic journeys. His student, Rabbi Shimon bar Yochai, was responsible for the classic Kabbalistic work, the Zohar, and his opinions pervade every section of the Talmud. At times, and in certain places, philosophical inquiry pushed aside the received tradition to dominate Jewish thought. 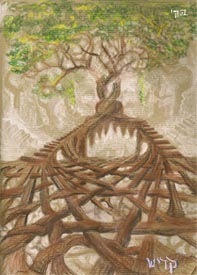 Yet it was rarely considered the native theology, but rather a kind of grafting from alien vines. Philosophy works upward, striving to create a single vision out of disparate parts. Kabbalah does the converse, beginning with a vivid, holistic vision and attempting to transmit that vision to others. Nevertheless, especially after the Spanish expulsion, the rationalism and much of the terminology of the philosophers became integrated into the holistic wisdom of the Kabbalah. The result was an unprecedented flowering and popularity of Kabbalistic thought. Philosophical inquiry was never considered our native theology. Yet the Kabbalah later benefited through synthesis with it. In the critical era when halachah was codified and established (from the Spanish expulsion until the mid-seventeenth century), almost all serious scholars were steeped in Kabbalah. Rabbi Yosef Caro, author of the standard code of Jewish Law, the Shulchan Aruch; Rabbi Moshe Isserles, whose glosses made that code acceptable to Ashkenazi Jewry; as well as most of the standard commentators to that code, penned Kabbalistic works as well. Even the popular synagogue sermon was often dressed and garnished with Kabbalistic references. To most of the Jews of Muslim lands, the Zohar is as sacred as the Book of Psalms. The Chassidic movement grew directly out of Kabbalah. The original opponents to the Chassidic movement, such as Rabbi Elijah of Vilna, were masters of the Kabbalah. Many of the standard commentaries studied today on the Five Books of Moses are replete with references to Kabbalistic ideas. That’s why attempting to understand the Jewish experience without an understanding of Kabbalah is akin to analyzing a person’s behavior without knowing what is going on in his mind. The great Jews of ages past who did not taste of the Kabbalah felt that inner soul intuitively within the Torah they studied, within their prayers and within their practice of mitzvot. In all these things, their souls shone vibrantly. Over the centuries, as the world became a more sterile, materialistic and confusing place, that soul became wearied and fell dormant. Today, the sure path for a thinking person to sense the soul of the Jewish experience is to taste of its inner secrets. Today, Judaism stripped of Kabbalah is a body stripped of its soul. Study of Kabbalah today is vital for a yet more important reason—as an essential stage in the final evolution of humankind. We’ll get to this later. Can You Be Creative with Kabbalah? A received wisdom would seem to imply no room for originality or creativity. The Zohar tells us that one who creates his own ideas and calls them Torah is creating an idol. The Kabbalist is creative, he may have illuminative visions, yet all he teaches is but commentary on received tradition. “Understand with wisdom” means to investigate well whatever your teacher has taught you in the wisdom of the modalities. After all, in these matters we only transmit a bare outline. From that outline, each person must understand one idea from another. “This matter is told only to a sage who understands with his own mind.” From this, you see that a person must use his own mind to compare one thing to another, and thereby extract one idea from within the other. That way he will have a procreative mind and not a barren one. Yet then it says, “be wise with understanding.” This means that when you originate and analyze with your intellect so that you may understand, you must take care to conceive the idea and explain it within the framework of the tradition of the rabbis and their terse words. The original ideas must be included in that which you have gained, whether much or little. Kabbalists may have visions, but they do not found their teachings upon those revelations. Whatever insights they have, they view these as mere illuminations of the sacred texts and teachings they have already received. In this way, the Kabbalah remains a tree of life, with deep roots holding it firmly in place, while bearing sweet new fruits at all seasons. What Are Some Basic Ideas of Kabbalah? A metaphor for G‑d. G‑d is unknowable and without form, yet all forms extend from Him. The idea of unbounded light helps to communicate this idea. Yet the essence of G‑d is beyond even the infinite. And G‑d is found in darkness as He is found in light. See: Is G‑d an It, an I, or Nothing? Similar to the modern idea of energy and matter. The act of creation is sustained through a dynamic of infinite light compressed into defined states of being called “vessels,” which then project the light to create a myriad of beings. The chasm between the Infinite Light and a finite creation should be insurmountable, and yet here we are, decidedly finite projections of that Infinite Light. This is the mystery of the ten sefirot: how the Infinite interacts with the worlds it has generated through the medium of ten luminous modalities. The order of the sefirot moves from the intellectual domain through emotion and down to the domain of “dominion”—the sphere of actually getting something done. This is the “divine image” in which the human being is created. By knowing ourselves as human beings, therefore, we are able to discover the divine. And by understanding the divine, we are better able to heal and nurture the human being. In Hebrew, there are no things, only words. The Hebrew name of each being contains its essential life-force. The infinite power of the Creator is found within each instance and object of the creation; nothing is outside of that light and nothing is void of it. The twenty-two letters of the Hebrew alphabet express the specific articulations of that creative force. One who masters their mystery holds the key to understanding the nature of each thing. The entire universe is a dynamic of male and female union. The life-soul of the universe, known as the Shechinah, and the Infinite Light yearn to reunite with one another, as does the human soul yearn to reunite with its origin within G‑d. The study of Torah and performance of mitzvot brings about these unions, thereby allowing new, transcendental light to penetrate the cosmos. The greatest of the Kabbalists, Rabbi Yitzchak Luria, known as “the Ari” (the lion), was able to explain many arcane passages of the Zohar through a doctrine of tikun, meaning “repair.” Reversing the standard paradigm, the Ari explained that the world was created in a broken state, and the human being was placed within it to gather the shattered pieces and repair its wholeness. The eventual result is the union of finite existence with the Infinite Light, beyond even that which was at the outset of creation. How Does Kabbalah fit Into the Modern World? In the past hundred years, science has laid bare the intricacy and sheer vastness of the physical world in a way previously inconceivable. We’ve uncovered an amazing harmony by which the entire physical universe is seen as a singularity, every particle integrally related to every other particle, a harmony by which even matter and energy themselves are essentially a single dynamic. Kabbalah has the potential to heal the rift between the cold outer world we observe and the warm, inner world of the observer. Technology has provided us means to share and examine this knowledge that were unimaginable even a generation ago. Programming our own virtual environments enriches us with metaphor by which we can imagine what it means to create a world and sustain its existence at each moment. Humanity should be swept away in awe and wonder, yet instead we have been left out in the cold. Ironically, in our search for the unity of physical law, we have severed ourselves from that unity, digging a sweeping chasm between the hard, material world that surrounds us and the soft, human world that burns within. In brokering that divorce, we have rendered ourselves the orphans. Kabbalah heals that wound. It describes the world about us in the language of our own psyche. It puts us in touch with a world composed not of dumb matter but of fathomless mind. The scientist describes the universe within the dimensions of time and space, in terms that he can count and measure. Yet not everything that counts can be counted. One of the most ancient works of the Kabbalah, the Book of Formation, describes yet another dimension: that of life, consciousness and soul. Whatever exists in time and space, we are told, is first found deep within that inner dimension. It is a dimension with which we are intimately familiar. The artist looks at a tree and sees not a cellular structure of carbon, but beauty, life and magnificence. The music lover hears in a string quartet not the vibrations of nylon strings and their overtone series, but the struggle for resolution within the composer’s soul. The literary critic reads within the novel’s words the thoughts of the author, within the thoughts the attitudes, within the attitudes the perception of the world that generates such attitudes, and within that perception the persona of the author himself. So too, the Kabbalist sees within each instance of reality not its palpable, defined presence, but a divine energy sustaining all existence, ever new as the water of the rapids is renewed each moment, generating and regenerating each detail out of the absolute void, imbuing each thing with its particular properties and life, each instance of existence in its own particular way. And within that dynamic of creation, the Kabbalist sees G‑d Himself. As it turns out, we have an affinity with this universe about us. Just as we perceive within ourselves layer upon layer of personality, deeper and yet deeper strata of consciousness, and yet within all this an indefinable core essence of being, so we can perceive deep within the universe a sentience infinitely greater than our own, and an essence that transcends knowledge and knowing altogether. Indeed, we are the children of that unknowable essence, our minds a faint reflection of its light within the muddy waters of the material world, our souls its very breath within these corporeal bounds. Why Do We Need Kabbalah Now? The open study of Kabbalah today is not just because we need the inspiration it provides, but because this is a vital stage in the evolution of the world. Spreading the teachings of Kabbalah in a form that the mind can digest prepares the world for the messianic era. The ultimate phase of this world is a messianic era in which “the occupation of the entire world will be only to know G‑d.” That doesn’t mean simply knowing that there is one G‑d, but knowing His universe as He knows it, and the wisdom behind it as that wisdom is one with Him. The preparation for that time has already begun, and we are in it. In the six-hundredth year of the life of Noah . . . all wellsprings of the great deep burst open, and the windows of heaven were opened . . . In the sixth century of the sixth millennium, the gates of supernal wisdom will be opened, as will the springs of earthly wisdom, preparing the world to be elevated in the seventh millennium. The sixth century of the sixth millennium on the Jewish calendar corresponds to the period from 1740–1840, indeed a period of explosive advances in technology and science. 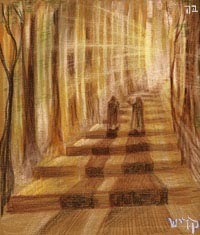 At the same time, the gates of supernal wisdom were opened through the chassidic masters of the Kabbalah. The earth will be filled with consciousness of G‑d as water covers the ocean floor. For more about the state of consciousness that will be attained at that time, read Getting to G‑dliness and watch Who Needs a Temple? Where Can I Learn Authentic Kabbalah? Speak with your local Chabad rabbi. He may be giving a class in Kabbalah, or a class on some topic from a Kabbalistic perspective. He may be able to set up one-on-one study for you. Or he might direct you to someone who can. JNet.org is a service that sets up one-on-one study by phone or video-chat, at the time of your choice. Chabad.org and KabbalahOnLine.org are both constantly expanding their already extensive libraries of articles, audio, video and animation on many topics of Kabbalah. Imagery by Natalia Kadish. Natalia is a surrealist artist inspired by the joy received from learning Torah and contemplating the infinite. See more of her art at NataliaKadish.com. To Anonymous in Wisconsin It is natural to think that the problem started with Adam and Eve, since you are getting your information from a translation. But the original says, "B-Ray-sheet Barah Ke-lokim et." And that does not mean, "In the beginning Gd created...."
What happened in the beginning was that the Infinite One made space within Itself for our world, and extended Itself into that space, but the vessels could not endure the power of that divinity and they shattered. It was Adam's job to repair the damage, but he wanted to prove he could do better than that, and so he ate the fruit. Big mistake. So it was left for all of us, his descendants, to each repair as much as we can. Every object in the physical universe contains holy sparks from the essence that spilled from the broken vessels. B"H Todah, Joshuah, but I am relying on a 1999 edition JPS Tanakh, and a Stone edition Chumash. And while I really appreciate your opinion, there was something prior to the first sentence. The title came before the 1st verse. This is where there appears to be a separation, yet it is merely a reflection. Similar to fitting a 72-letter name into the intention of a 4-letter Name. All that exists comes from the title B'REShYTh. I wish some one explained Kabbalah in simple term. I remained curious when the article explains what it is. What I got is deeply philosophical terminology describing in some abstract words. Soon after Sinai encounter, as per the history, the Jewish nation started revolting teachings of Moses. That means they soon forgot the divine wisdom revealed to them. Taimur, there is so much to learn about this world that G-d created (for those who believe in His creating All) ... and our own self - that it's best to start In The Beginning. Proceed until years of study and as much as your brain will digest - and when ready to explore Kabbalah in addition to Torah, see how your mind comprehends past all you've learned from Torah, etc. Kabbalah might be considered additional information . . . but does not replace the Torah. It is long since I last wrote but I still savor the wonderful essays. body of which you have written. Knowledge On Sukkos, we have four species in the lulav (palm branch) and etrog (citron). One species represents the fully observant knowledgable Jew. One represents the one who has knowledge w/o observance, and one is observance w/o knowledge, and one is the one w/o either knowledge or observance. The ceremony we perform is to bring all four together, because all four exist and are necessary to one another. As for Hebrew: singing Hebrew songs definitely feels special. I wish I knew all the words, but it definitely feels different from singing English songs. I wish I could read the text at a normal rate, instead of taking several seconds to sound out each word, but experiencing the Hebrew word, with the related meanings of that root, knowing that choosing any one English word is leaving the others behind, makes me want to use the Hebrew words despite my limited capacity. I wish I could spell Hebrew words and quickly identify their numerals I can do it with the letters through yud. Then I want to go to eleven but the standard measure says, go to 20, 30, etc. So if the word contains a mem or a resh, etc., I don't know its numeric value and can't do the gematria.--and the gematria is full of meaning. ooops- compare nov. 29 2011 Sincere apology G and Sh. I did not realize that you were making self-comparisons. Self-comparison is very worthwhile. Yasher koach. I do it. I think what blinded me was being in shul on a Shabbat and a fellow i know sitting next to me says that only people who know Judaism should be called on for aliyahs because they can 'appreciate' it. I simply told him that idea was a bad one. He moved, thankfully. It spared him listening to the irrationality of his idea. Jews are famous for brinksmanship, elitism and entitlement. It's bogus and worse, a turnoff. gently May i say gently that studying the Hebrew language is not key/integral to making me a better Jew, nor more religious. I have learned to daven. Next step to refinement in the way of Hebrew would be cantillation of a few Haftorahs. For my purposes, singing Hashem's praises far outweighs a need to learn to translate Hebrew. I place a premium on song. Works for me. Hashem can unscramble any language perfectly. I might try to follow Chabad, but that does not make me any better than a Reform nor Haredi Jew. Our enemies have only one definition for us: A Jew is a Jew. They do not ask what language a Jew speaks, nor how pious he is. It's a level playing field. Sometimes we forget that we are all parts of a puzzle, no one piece more important than another. Kabbalah Each of us has different needs and experiences in terms of how we follow our simple desire, our Ratzon HaKadoom(Kadmon), our purpose in this Life. lack of love nov 27 2011 You say that you can " definitively state greater appreciation for what's in Torah ". There are a few variables to consider in light of this illusion. 1. Why do you need to compare to others at all ? 2. Ability of Torah scholars one learns with. The most preeminent have difficulty elucidating certain portions of Tanya, the bible of Chassidus. 6.Everyone has different learning styles. What works for one may not work for another. These are just a few variables of many. What it leads to is that you cannot '' definitively state greater appreciation " of Torah. That position lacks humility. It lacks humbleness. It lacks refinement. It lacks truth. It lacks Chesed/Lovingkindness. It lacks Truth. Don't change your attitude. We simply differ.